January 27, 2018 (Joseph Thomas - NEO) - Washington's Asia-Pacific strategy has gone from maintaining primacy over the region for decades to increasingly desperate attempts to salvage its now waning influence. This is in part due to China's rise as an economic, military and political regional power as well as the increasing self-reliance of smaller but still pivotal Asian nations. This includes the Southeast Asian Kingdom of Thailand. The height of contemporary US influence over Thailand was in 2001 when Thaksin Shinawatra became prime minister. His administration eagerly catered to US interests at Thailand's own expense, including sending Thai troops to participate in the 2003 invasion and occupation of Iraq, hosting the US Central Intelligence Agency's extraordinary rendition programme on Thai soil, attempts to sign a US-Thai free trade agreement without approval of Thailand's parliament and the privatisation of Thailand's natural resources. He also indulged in a wide spectrum of human rights abuses including a 2003 90 day "war on drugs" that left nearly 3,000 innocent people extrajudicially executed in the streets, a 2004 crackdown on protesters in Thailand's restive deep south that left over 80 dead in a single day, the assassination or disappearance of his political opponents and a concerted campaign of fear and intimidation waged against the Thai media. 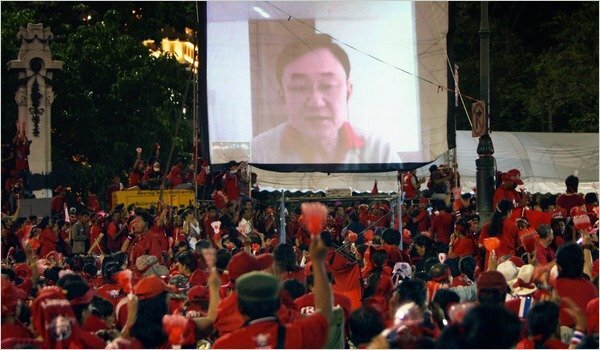 Image: Thaksin Shinawatra, since fleeing the country after a criminal conviction, has led protests and election campaigns remotely by telephone and video ever since. In a brief period between 2009-2010 when Shinawatra's political opponents took power, he deployed protesters and armed militants in the streets of Thailand's capital of Bangkok where they promptly fought gun battles against police and soldiers, carried out grenade attacks on counter-protesters and engaged in citywide looting and arson leaving nearly 100 dead. 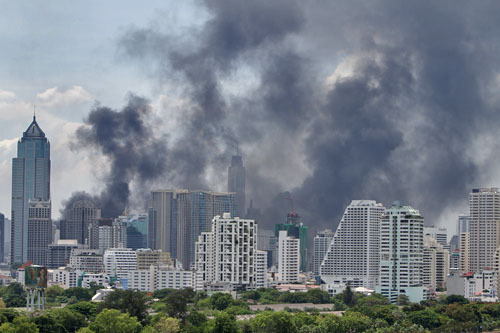 Image: Arson consumes Thailand's capital of Bangkok in 2010 after militants deployed by Shinawatra fled Thai troops after weeks of gun battles. During the 2011 election, Yingluck Shinawatra's campaign signs literally read, "Thaksin Thinks, Pheu Thai Does," an open admission that a convicted criminal and fugitive was running for office and that his sister was merely a placeholder. Yingluck Shinawatra was ousted from power in 2014 in another coup following months of mass protests against Shinawatra's government and Shinawatra's systematic use of terrorism to target and attempt to quell the protesters. Fronts posing as Thai nongovernmental organisations including media platform Prachatai and rights advocates Thai Lawyers for Human Rights are openly funded by the United States government via its National Endowment for Democracy (NED) as well as convicted financial criminal George Soros' Open Society Foundation. Thailand's refusal to accept Shinawatra despite the risks of confronting him and the interests he represents fits into a larger regional trend where Asian states are increasingly reasserting themselves over enduring US primacy. Thailand has begun replacing what has for decades been a military arsenal dominated by American equipment with tanks, armoured vehicles and even naval vessels from China. Thailand has also inked deals and begun construction on a number of infrastructure projects with Beijing, including high-speed rail that will link major Thai cities together and link Thailand itself with both its immediate neighbours and China's southern Yunnan province. 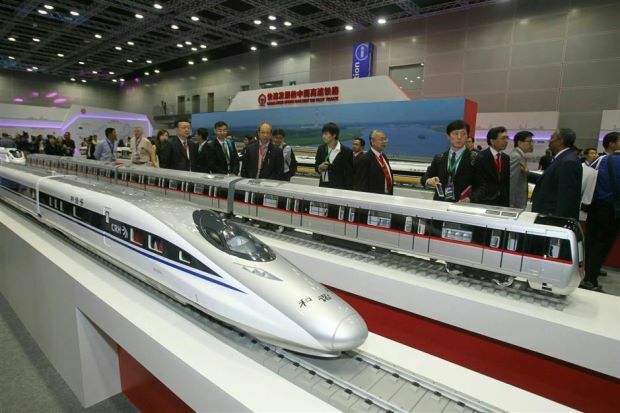 Image: While the US offers Asia "free trade," China offers the region tangible infrastructure including metro and high-speed rail infrastructure and rolling stock. Thailand's geopolitical pivot is more than mere posturing to counter pressure placed on it after removing Washington's political proxies from power. It is a new, permanent reality that other nations across Asia are also contributing to. Thailand is not alone in its quest to replace Washington's enduring and coercive influence over the region with tangibly constructive ties with Beijing and others. 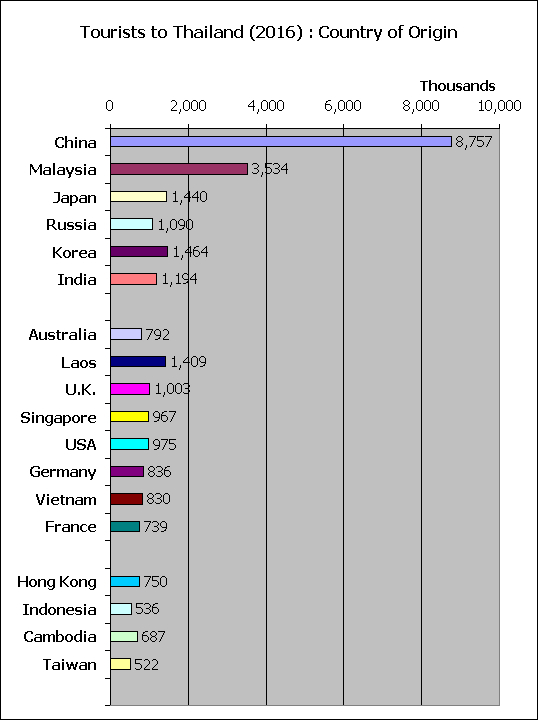 China has helped relieve a number of pressure points the US has maintained against the rest of Asia for decades. This includes Washington's ability to leverage economic pressure against Southeast Asia to coerce it along America's desired path. After the more recent 2014 coup, the US attempted to once again leverage economic pressure against Bangkok to return the Shinawatras back to power. This included attempts to target Thailand's seafood industry and tourism. Despite these attempts, Thailand has endured. In terms of tourism, attempts by the American and European media to scare off potential visitors failed spectacularly, thanks to China's regional rise. Perhaps at one point in Thailand's history, its tourism industry which accounts for about 17% of the nation's GDP, depended on Western visitors who, if convinced to avoid Thailand, could inflict damage to both the industry and to the economy. However, today, Chinese tourists make up the vast majority of visitors entering Thailand. In 2016 approximately 8.7 million Chinese tourists entered the Kingdom, followed by 3.5 million Malaysians and 1 million Russians. It is curious to note, however, that terrorist attacks targeting a downtown Bangkok shrine popular with Chinese tourists and bombings targeting other tourist destinations around Thailand followed the US and European media's failed campaign to sabotage Thailand's tourism industry. This example illustrates how once useful "soft power" weapons at Washington's disposal have been defused by Thailand's and Asia's ability as a whole to diversify their economic and political ties, and move out from under the shadow of Washington's primacy. It is also an example of how Washington is apparently willing to use much more drastic options, including terrorism, to gain with blood what it has failed to gain through "soft power." China's development of infrastructure both within its territory and connecting its economy with nations well beyond it is another example of an alternative to Washington. US free trade agreements are transparent grabs at a nation's economy and natural resources. The text of most US free trade agreements read like updated versions of concessions forced upon nations by "gunboat diplomacy" during the height of the British Empire. By developing China's neighbours through massive infrastructure projects, Beijing is not only empowering itself, but empowering those nations hosting this new infrastructure. Not only will nations like Thailand be able to develop more constructive ties with Beijing as an alternative to Washington, it will be able to develop its own economic capacity negating previous dependencies on and vulnerabilities to concepts like "free trade." The US and Europe are visibly ratcheting up pressure on Thailand in 2018. Elections following the 2014 coup have been repeatedly pushed back, primarily because the cause of the coup, Thaksin Shinwatra and the immense power, influence and impunity he enjoys, has yet to be removed from Thailand's political landscape making real free and fair elections an impossibility. For Washington, no election that even remotely puts Shinawatra and his Pheu Thai Party at a disadvantage will be recognised as "free and fair." The US and Europe have signalled that delaying beyond 2018 will not be tolerated and is already creating "space" for Shinawatra's supporters to begin preparing for 2009-2010-style protests. With the US and European media still denying violence carried out by Shinawatra and his supporters in 2009-2010 and again in 2014, the Thai opposition will have a clean slate from which to stoke murder and mayhem at the cost of Thailand's political and economic stability. Time is on Thailand's side however. With each year, Thaksin Shinawatra and his political networks grow weaker while their sponsors in Washington, London and Brussels wane in terms of both real geopolitical power and their ability to influence public opinion at home and abroad. But while some in the US and European media appear to be making peace with the fact that Shinawatra is unlikely to ever make a comeback, where they have decided to retrench is particularly concerning. 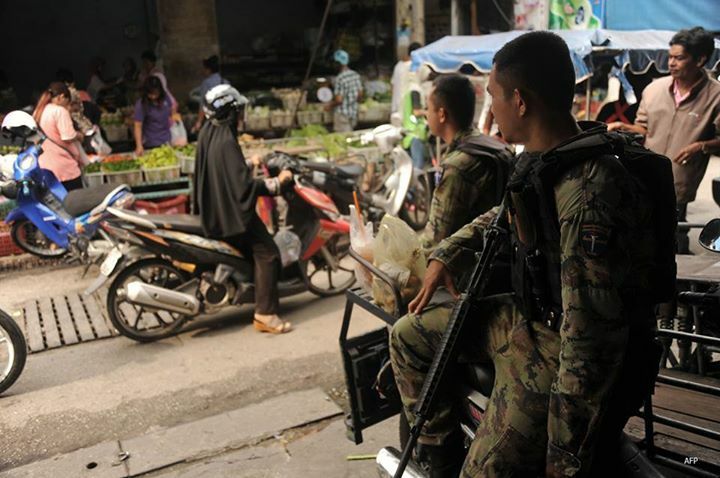 Thailand's deep south hosts an ongoing militancy led by nebulous separatists. Violence erupted in 2001 with Shinawatra taking office after two decades of enduring peace. The conflict has since cost thousands of lives but has remained at the fringe of both domestic and international media attention. However, as it becomes clear that Shinawatra and his political supporters have exhausted themselves, US government-funded organisations attempting to undermine Thailand's peace and stability have increasingly turned their attention toward the conflict in the deep south. Some such organisations are participating in "workshops" in the deep south aimed at "empowering" locals to legally contest the Thai government and impede ongoing security operations. The US used so-called nongovernmental organisations in and around Russia for similar purposes during Moscow's protracted security operations in Chechnya. The US has leverage terrorism everywhere from Afghanistan in the 1980's to Libya and Syria beginning in 2011 to the Philippines just last year as a pretext for political and military involvement in the sovereign affairs of foreign nations. The US openly seeks a military presence on mainland Southeast Asia to augment its military presence in Korea, Japan and the Philippines in the east and its ongoing military occupation in Afghanistan in the west as part of a larger strategy of encircling China. Inflaming Thailand's deep south while attempting to return a US proxy to power could produce in the future circumstances that finally see US troops permanently stationed on Thai soil and along China's peripheries. Similar efforts are ongoing in neighbouring Myanmar where the US is fanning the flames on both sides of the current Rohingya crisis. There exists a real prospect of US troops stationing themselves in Myanmar, even in small numbers, to serve an "advisory role" for "anti-terror" operations against militants US ally Saudi Arabia is arming and funding. 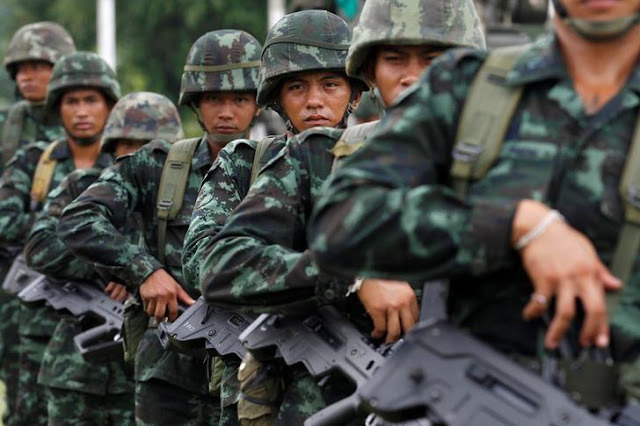 Thus, 2018 will not only see a concerted attempt to undermine the current Thai government and force it to hold elections the US will do all in its power to ensure Shinawatra wins, but also will see US-funded organisations in Thailand increasingly attempt to leverage violence in Thailand's deep south to endanger not only Thailand's peace and stability, but peace and stability across Southeast Asia.